For a third straight summer, nearly a dozen young great white sharks returned to a spot in Monterey Bay near the cement ship in Aptos, according to a report from NBC affiliate KSBW in Salinas. 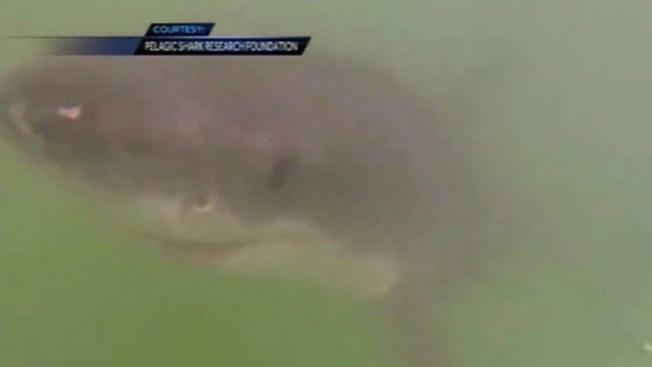 A shark expert says the current movement and warmer temperatures in the ocean are bringing them up from Southern California. "It's one of the warmest, calmest areas in the bay," Sean Van Sommeran, of the Pelagic Shark Research Foundation, told KSBW. "They don't seem to be in the hunting mode when we're observing them here, they really are just lounging around." Van Sommeran said there are 22 shark species in the Monterey Bay, but the larger sharks leave the area for the summer, so the pups, as he calls them, feel safe while they're gone. "They have for the past three years shown up as early as March," he said. "They start showing up in numbers in April. Then by May, June, July, we find them right here." He and his team with the research foundation have been studying them for years using underwater GoPros and drone cameras.